Five months before the start of the Second World War, on 7 April 1939, Italy invaded and quickly conquered Albania. Eighteen months later, on 28 October 1940, Italian forces in Albania invaded Greece, immediately invoking a long-standing guarantee that Britain would support Greece if attacked without provocation. The Greek Army was able to defeat the Italian thrust into their territory, quickly pushing the Italians 30-50 kilometres inside southern Albania, and successfully defeated a major Italian counterattack in March 1941. However, Hitler, wishing to secure Germany's flank for the proposed invasion of Russia had ordered the Nazi invasion of Greece on 12 November 1940. In February 1941, the new Greek Prime Minister affirmed his country's determination to resist a German attack and commenced talks with the British on the size and composition of the British Force that would assist the Greek Army. Both the 6th and 7th Australian Divisions and the New Zealand Division were to provide most of the infantry with the British supplying the armour and artillery. 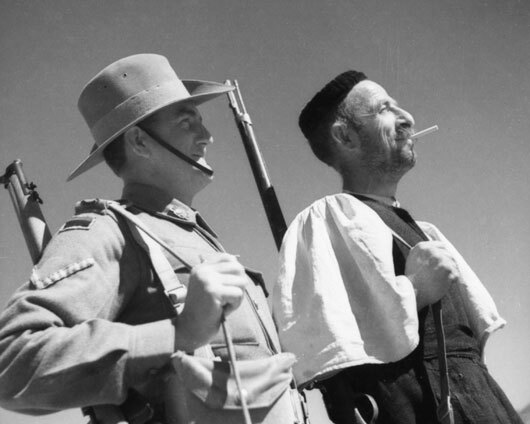 However, the German offensive in Cyrenaica meant that the 7th Division was being held in reserve in Egypt. Naval convoys moved 60,000 troops and their equipment to Greece between 4 March and 18 April, but the Germans had already begun their invasion through Bulgaria on 6 April. With the main Greek strength on the Albanian front, the under-strength Greek divisions facing the Germans were quickly overrun. At Vevi Pass on 11-13 April and Tempe Gorge on 18 April the Australians tried to resist the German advance in central Greece but by 22 April, the order to evacuate Greece had been given. 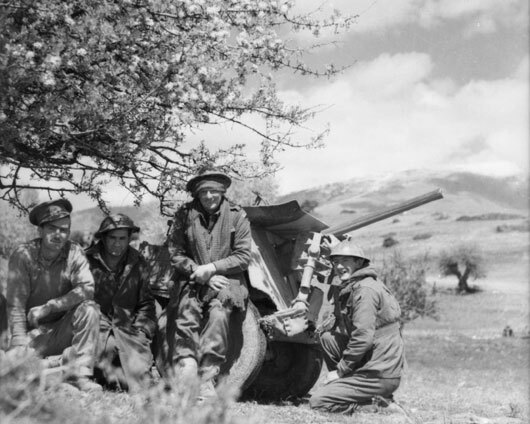 On 24 April, Australian soldiers of the 19th Brigade and their comrades in the 6th New Zealand Brigade were charged with holding Brallos Pass for as long as they could to allow other allied troops to withdraw from the Greek mainland. It was a dangerous situation, and as General Vasey, commander of the 19th Brigade famously instructed his troops: "Here we bloody well are and here we bloody well stay!" The fierce resistance of the Australians and New Zealanders stalled the German advance for an entire day, and destroyed 15 German tanks in the process. 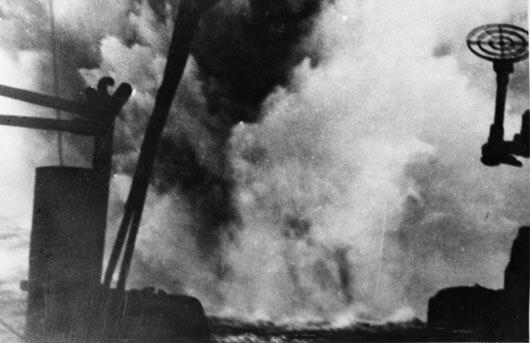 Water sprays into the air from a near miss during an attack on HMAS Perth by German bomber aircraft during the evacuation of Australian soldiers from Greece (AWM 306799). 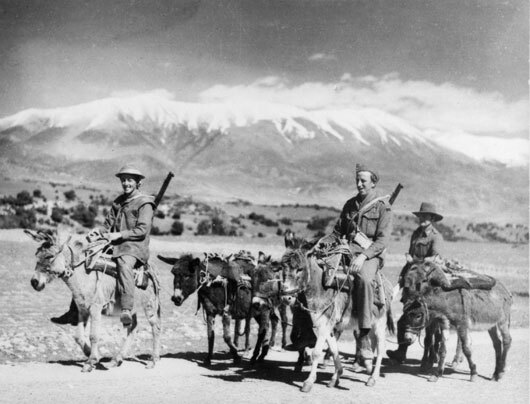 Three diggers use donkeys as their means of transport along the mountainous roads of Greece (AWM 006714). 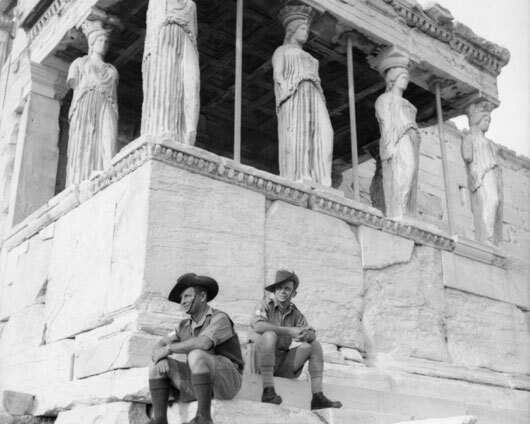 The Maidens and the Aussies in Athens (AWM 006785). 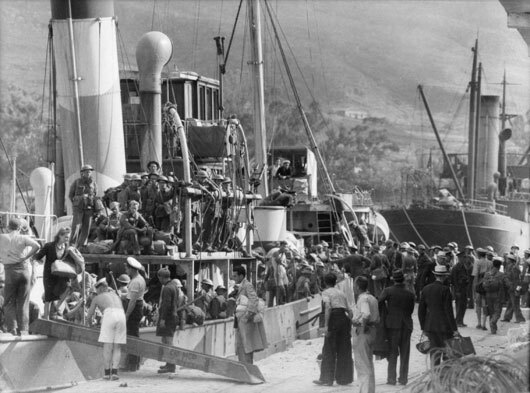 Troops were evacuated from various points on the Greek coastline, with all types of shipping being pressed into use (AWM 007609). 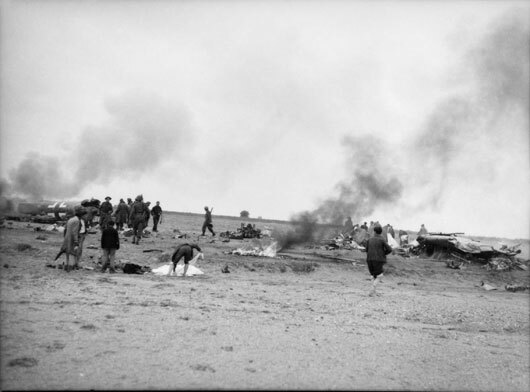 The remains of a German plane brought down by Bren gun fire in the riverbed north of Lariss (AWM 007625). Members of the 1st Anti-Tank Regiment AIF rest after withdrawing from positions on the Monastier Gap, where they occupied one of the most forward positions facing the German onslaught (AWM 007647). Older men were left in the villages, where they formed themselves into a home guard to fight off German parachutists and defend their homes (AWM 007759). A wounded Private C.E. 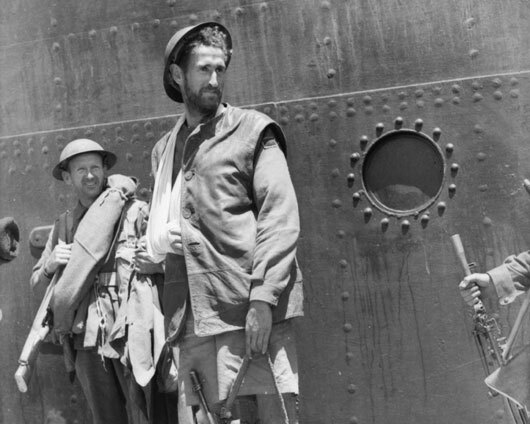 Armstrong of 2/3rd Australian Infantry Battalion lands at Alexandria, Egypt after the withdrawal from Greece (AWM 008175).